Presentation of the IJGlobal Awards 2018 in London's Natural History Museum. KfW was represented by Babette Stein von Kamienski (fourth from left). 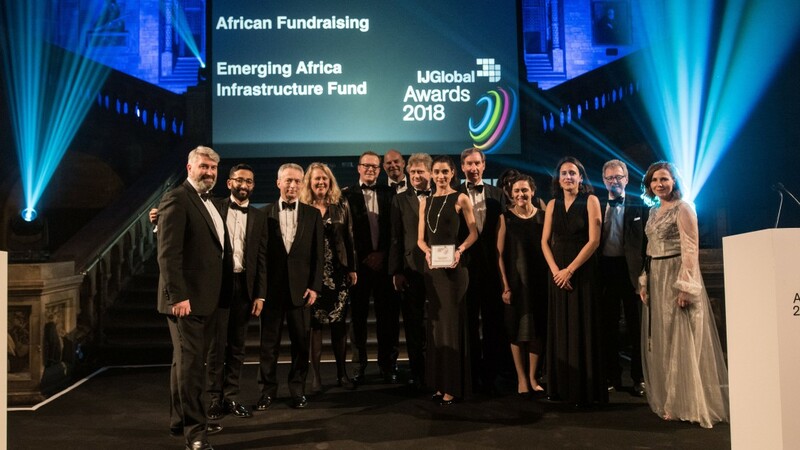 The current financing round for the Emerging Africa Infrastructure Fund (EAIF) – once again with the participation of KfW Development Bank – has won the IJGlobal African Fundraising Deal Of The Year Award. The award was presented on 21 March 2019 in London. Mobilising capital – especially also from private investors – for the urgently needed expansion of infrastructure in African countries is and remains one of the greatest challenges for development policy. The Emerging Africa Infrastructure Fund (EAIF) is setting standards here with the involvement of KfW Development Bank. The current financing round, with a total volume of more than USD 385 million, was therefore awarded this year's “IJGlobal African Fundraising Deal of the Year Award” by the Project Finance & Infrastructure Journal. KfW Development Bank has been supporting EAIF on behalf of the German Federal Ministry for Economic Cooperation and Development (BMZ) since 2005 and is the largest lender of debt capital. KfW is also participating in the current increase with two tranches of EUR 75 million plus USD 50 million, in addition to other development financiers such as the Dutch FMO and the African Development Bank. The Allianz Group's involvement as the first commercial anchor investor is groundbreaking. For the first time ever, Allianz has committed itself to long-term loan commitments in the triple-digit million range. This shows that even seemingly difficult markets can be attractive for large private investments if suitable conditions are created with innovative instruments. The fresh capital will be used to further enlarge EAIF's portfolio over the next 5 years. The distinction of the IJGlobal Award and the attention that comes with it are an incentive for all participants.